No reviews yet for this trip. Browse other reviews below for STORY Land & Sea. We had the time of our lives on Great Cities Tour. Looking forward to planning another Italy tour. Every moment special !!! Today is your flight date from North America, Canada, Australia or New Zealand - Your flight is not included, however we do have an air department that could provide you a quotation. You will cross the Atlantic Ocean tonight en-route to Europe. Your Small Group Tour will commence on Itinerary Day 2 upon arrival into Galway, Ireland. Accommodation in Galway, 2 Nights; Deluxe: The Galmont Hotel or similar. ; Classic: Galway Bay Hotel or similar. Upon arrival into Galway, check in to your hotel. If you have arrived early, have no fears, you can drop your bags and set off by taxi to wander Galway City's cobble stone streets. Feel yourself stepping back in time to medieval Ireland. Known the world over for its friendly people, charming streets, shopping and nightlife, Galway will refresh flagging spirits like no other place. If you have had enough travel for one day, you can relax at your hotel overlooking the beautiful Galway Bay and take a nice walk along the promenade. There are a number of very nice places in Salthill to have a bite to eat before you return to the hotel around 2:00 pm to check in. We get everyone checked in and plan for a 4:00 pm transfer to Galway city center for an informative orientation walkabout. Join your Tour Captain for an Orientation Walk on your arrival day in Galway. Learn the major landmarks and the lay of the land in relation to our hotel. We'll introduce you to the best ATM machines and other helpful information for your stay in Galway. We do walk on our small group tours of Scotland & Ireland. We walk a lot, but it's unhurried and there are ample opportunities to sit and relax. You must be physically capable of walking and experiencing the many cobblestone-paths and lanes of Scotland. STORY Way Dining: Enjoy a welcome dinner tonight with your Tour Captain in the incredible Irish city of Galway. Our approach to dining is truly unique: We've collected our favorites dishes from the incredible restaurants we visit for each included dinner. No buffets here! Your Tour Captain is there to make sure your dining experience goes smoothly. For the 5 total included dinners, your Tour Captain will select a variety of appetizers, featuring regional cuisine, and will select your wine for the evening ~ a variety of red and white wine from the region you're traveling ~ and yes, there is always a Irish or Scottish Pint available. After a wonderful Irish breakfast at the hotel, meet our driver and guide in the lobby as we set out to explore the Connemara area of Ireland. Now we are entering the wild beauty of Connemara: Mountains start to rise and there are vast, open, breath-taking spaces in the Maam Valley, a spectacular region that divides up the Maamturk mountains of Connemara. Dropping down into the village of Leenane where the film The Field directed by John B. Keane was filmed, Killary Fjord (Ireland’s only fjord) unfolds. Here you can see the salmon and mussel pots floating on the surface of the water where the fish are farmed here. Arriving now at the highlight of the tour, Kylemore Abbey & Gardens, one can absorb the tranquil atmosphere while walking in one of Ireland’s most peaceful scenic areas. We'll take in a sheep dog demonstration which is quite fascinating. This afternoon enjoy the balance of the afternoon at leisure. We enjoy a panoramic journey and return to Galway. 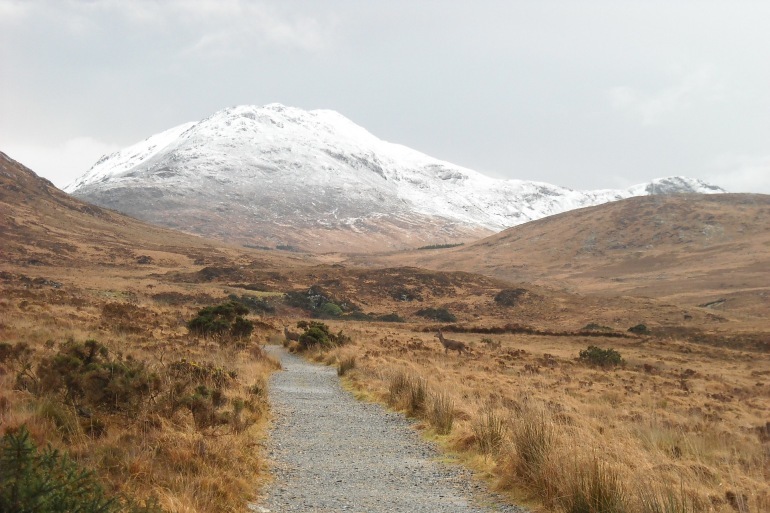 Connemara - The drive is on the Wild Atlantic Way driving route and winds its way in spectacular fashion along the northern side of Killary Fjord, through a series of valleys between the peaks of Ben Creggan and Ben Gorm. Leenane Village - The picturesque village of Leenane is our destination and the way there provides an unforgettable driving experience through the Connemara wilderness. Consider an optional dinner tonight with the Tour Captain or explore at leisure. We depart Galway for Killarney and experience the Cliffs of Moher, a sheer precipice that stretches for 5 miles along the Wild Atlantic Way. After check in we offer the jaunting carts to Ross Lake where we will do a STORY exclusive at Ross Castle Ruins. Note: The jaunting carts may be on the following day depending on weather and schedule." The Cliffs of Moher - The Cliffs of Moher rise to a height of 668 feet above the Atlantic and is one of the most impressive coastlines in Ireland. In nesting season the cliffs are home to a variety of seabirds. Ross Lake & Ross Castle Ruins - An exclusive experience from STORY (dependent upon weather conditions). STORY Way Dining: Dinner included tonight with the Tour Captain in Killarney. This morning we’re off to explore some of the highlights of the Ring of Kerry from the town of Kenmare. The "Ring of Kerry" - A beautiful drive on the coast. Join the Tour Captain for an optional dinner in this town known for its traditional Irish music and pubs. Today we head to Dublin with a stop at Blarney Castle, where you will have the chance to kiss the famous Stone of Eloquence (some call the gift of Gab) and time to pillage the adjacent woolen mills. Situated 8km from Cork City, this historic castle is most famous for its stone, which has the traditional power of conferring eloquence on all who kiss it. In the grounds of the castle, the Rock Close, and its surroundings, is a curious place of ancient trees and far more ancient stones, by legend a garden of druidic origin and a center of worship in pre-Christian days. The place has an aura of magic and mystique with Wishing Steps, Witch's Kitchen, Druid's Cave and many other delights, telling a story of centuries past. Blarney Castle Estate offers visitors the chance to stroll in one of the country's most spectacular gardens. Blarney Castle & House are set in acres of parkland filled with rare and unusual trees and plants. There will be time for lunch and shopping at the nearby Blarney Woolen Mill's, the largest in Ireland. Blarney Castle - The word “Blarney” was introduced into the English language by Queen Elizabeth I and is described as pleasant talk, intended to deceive without offending. The stone is set in the wall below the battlements, and to kiss it, one has to lean backwards (grasping an iron railing) from the parapet walk. Stone of Eloquence - The gift of 'gab' is just a castle's stairwell away from you if you dare! Our destination this afternoon is Dublin. Upon arrival we will check in, freshen up and join the Tour Captain for a guided orientation walkabout of your Dublin surroundings. Story Way Dining: Join the Tour Captain for an included dinner this evening. After your full Irish breakfast this morning meet the Tour Captain and our expert local guide in the lobby to commence our walking tour exploring the city center. Enjoy an informed and fun perspective of life and history in Ireland’s capital. The walking tour will begin at Trinity College Library where we include entrance fees to see the famous Book of Kells. In the afternoon you may choose to visit Kilmainham Gaol, The Guinness Storehouse, The Dublin Writers Museum or any of the great museums and galleries. Trinity College Library - Inspiration for movies and more. St. Patrick's Cathedral - Included admission and tour with our guide. Enjoy our guided walking tour of the heart of Dublin. Optional dining tonight with your Tour Captain or explore at leisure. Included Dining: Oban Welcome Dinner Yonight, the STORY Way! Join your Tour Captain for a Welcome Dinner in Oban, Scotland. Join your Tour Captain Host for our Orientation Walkabout where you will learn about the island. Enjoy an included dinner tonight at an exclusive restaurant this evening with your Tour Captain to kick off the Scotland portion of our tour. This morning we are off by Ferry to the Islands of Mull, Iona and Staffa. The Isle of Mull is the second largest island of the Inner Hebrides, off the west coast of Scotland in the council area of Argyll and Bute. Mull is the fourth largest Scottish island and has an area of 338 square miles. The coastline of Mull is almost 300 miles long. The population of Mull, Iona and Ulva is around 1,800 people which is probably doubled in the summer because of the many tourists that visit Mull each year. Much of the population lives in Tobermory, the only burgh on Mull until 1973, and its capital. Traveling through Mull our destination is the small Island of Iona. In 563 Saint Columba, exiled from his native Ireland, founded a monastery on Iona with 12 companions. From Iona they set about the conversion of pagan Scotland and much of northern England to Christianity. Iona's fame as a place of learning and Christian mission spread throughout Europe. Iona itself is three miles long and a mile and a half long. Iona can be reached by ferry from Fionnphort on Mull and will bring the visitor to Baile Mor which means Big Town. Iona differs much from Mull, there are no tall mountains but instead there are some lovely white beaches. Interesting sites on Iona are Iona Abbey which is home to the St John's Cross in the Abbey museum, Iona Nunnery, St. Martin's Cross and several other Celtic Crosses. The uninhabited island of Staffa includes the famous Fingal's Cave.Fingal's Cave was immortalised by Mendelssohn in his Hebrides Overture, after he visited the island in 1829. The island's distinctive six-sided columns of rock are formed from basalt, the same as the Giant's Causeway in Northern Ireland. During spring and early summer, the cliffs and grassy slopes provide nesting sites for various seabirds including guillemots, razorbills and puffins. We ferry back to Oban later in the afternoon and then you are invited to our optional dinner in town before traveling back to our accommodations for the night. Tonight, join your Tour Captain for an optional dinner in town before traveling back to our accommodation for the night. This morning after a wonderful Scottish breakfast we depart Oban and travel deeper into Scotland. No journey would be complete without experiencing this amazing drive. We begin by by hugging the coast of Loch Linne, one of Scotlands most photographed lochs. We will be traveling through the infamous area where the MacDonald Clan was massacred by the Campbell Clan. Heading up the mountain you will be treated to spectacular views of high peaks, waterfalls and heather all around. Passing over the mountain we will discover the vastness of the Rannoch moor as we make our way to Stirling. We will make our way to the home of Sir William Wallace and Robert the Bruce to tour the Castle. In the distance you will see the monument erected to Sir William, The Wallace Monument. Afterwards we complete today's journey arriving into the magical city of Edinburgh, our home for the next three nights. Join your Tour Captain Host for a Welcome Orientation Walk on your arrival day in Edinburgh. You will learn where the major landmarks are located in relation to our hotel, the best ATM machines for exchange rates, and other helpful information for your stay. There will be time to for independent exploration of the Royal Mile or the Georgian New Town before our 7:00 pm welcome reception. Included Dining: Enjoy an included farewell dinner tonight with your Tour Captain to top off our great journey together. After a full Scottish breakfast we will meet our Blue Badge guide and driver for our driving/walking tour of Edinburgh's highlights, culminating with the tour of the Edinburgh Castle. Afterwards you will have the rest of the day to explore the many areas of Edinburgh such as the Grass Market area with it many famous pubs and eateries. You can take in the National Museum or the National Galleries or simply take a walk in the beautiful Princes Park. Edinburgh Castle - Included admission and tour. Walking Tour of the City - Enjoy our guided walking tour of the heart of Edinburgh. Day 12: Or Extend in Edinburgh As You Wish! Opt for additional experiences or explore more of Edinburgh on your own. Please inquire with Reservation about extensions and pricing. Travel Protection is not included. STORY Land and Sea recommends that you purchase a travel protection plan to help protect you and your travel investment against the unexpected. Services of a full-time, experienced guides and professional Tour Captain. Sightseeing: Comprehensive daily sightseeing per itinerary via private transportation with experienced, local driver. Admission & entrance fees to all sightseeing as detailed per itinerary." Portage: Portage (one suitcase per person) and all tipping (driver, restaurant, hotel and guide staff) included. Extra bag portaged for $USD119 per bag. STORY Land & Sea® luggage tags upon arrival first hotel." Passports & Visas: Travel documents are your responsibility including compliance with customs' regulations. PASSPORTS: A valid passport is required and must be obtained in person by each tour member at a local passport office." Lodging & Accommodations: Tour prices are per person, based on two persons sharing double or twin-bedded room with private bathroom with tub or shower. Single rooms subject to availability and at an additional cost (tour participants without a roommate will have to pay the single room surcharge). Hotels used are based on your itinerary." Service Charges And Taxes: All departure taxes and tipping are included.